The awe inspiring Srinakarin Dam in Thailand is located in the province of Kanchanaburi Thailand’s third largest province. Kanchanaburi province in Thailand is a place of great natural beauty and has several national parks within its boundaries. Kanchanaburi is situated on the western perimeter of Thailand and borders neighbouring Myanmar (Burma) at the famous ‘Three Pagodas Pass’.Khaoen Srinakarin national park is located two hundred kilometres from Bangkok and is the location of Srinakarin Dam.The dam was constructed to provide a natural water and power source for the surrounding area. 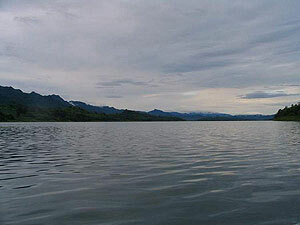 The damming of the River Kwai Yai (big) resulted in the formation of a gigantic natural reservoir of thousands of acres in size, and created a natural haven for wildlife containing numerous species of tropical plants and animals. This stunning wild venue is a massive ‘inland sea’ and home to various native fish species that are indigenous to Thailand, it is a highly atmospheric fishing destination surrounded by dense jungles and limestone peaks. Its banks are haven to a myriad of wildlife, flora and fauna making it a truly magical fishing location. 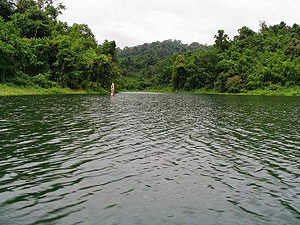 The dam is a very large expanse of open water with lots of deep water which can make location of fish difficult at times. Anglers visiting this venue will feel a sense of satisfaction when catching fish from this venue as it can be a challenging water at times. Sunken trees and twisted root systems line its banks giving cover to one of Asia’s most aggressive and sought after predatory fish the ‘Snakehead’. Snakehead Fishing at this demanding destination requires the use of a boat to explore the numerous potential holding areas in search of these elusive predators. 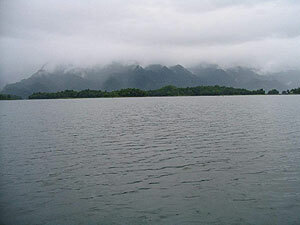 In addition to the various Snakehead species Srinakarin Dam also contains Hampala Barb (Jungle Perch) various other Barb species and Rohu (Indian carp). Floating fishing lodges are positioned at various parts of the lake and serve as basic accommodation and as a base from which to mount your exploratory trips to your chosen fishing areas. This amazing venue is best fished after heavy rains when water from the nearby lime stone peaks floods down through the dense bank side jungle carrying insects and other food items down into the lake. When fishing Srinakarin Dam at these times frenetic feeding spells can be encountered when the Giant Snakeehad become extremely territorial when guarding their newborn fry. This venue can be combined in one of our tailor made angling holiday packages which are designed to the anglers specific holiday requirements.